We are engaged in manufacturing, exporting and service providing a wide range of Du Pont Corian Top . These products are processed industrially using sophisticated technology and other essential equipment. We bring forth for our clients a wide collection of Kitchen Corian Tops. It is a well known brand name for a solid surface material created by DuPont. This is manufactured using appropriate combinations of alumina trihydrate and acrylic polymer. 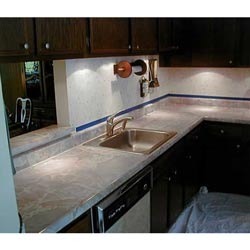 We also offer kitchen tops as per the taste and needs of our customers.